Not gonna lie–it was wonderful to have real tea this morning and eat breakfast! Jasper got a lot of schoolwork done again and I got some sewing and paperwork done. After lunch I went out to run some errands, including paying library fines left over from Lucy’s research paper. I also started a new knitting project and worked on a couple of writing projects. And I sat around feeling sorry for myself and updating Facebook obsessively this evening to see what was going on at Realm Makers. It would have been fun to be at the banquet tonight. Tomorrow is a chai party and also another fast day. It’ll be fun, right? For over a year now, I have been dealing with an array of health issues that have made every single day less awesome than it should be, and a lot of days downright miserable. Since we don’t have insurance and aren’t independently wealthy, going to a doctor isn’t an option, so I’ve been doing a lot of research and trying to help myself as best I can. I have adopted several habits that have been helpful, including giving up dairy and taking various supplements. Today I tried a new trick. Some of my more recent research indicates that I might get the results I’m looking for by fasting periodically. Today was kind of a “test” fast. Eventually, I need to work up to three-day fasts, but I’m not brave enough to do that right away. Today was hard enough. No almond milk or honey in my tea! No eggs for breakfast! During the morning I drank beef bouillon and it was better than nothing, but not by much. Halfway through the afternoon I remembered that I had chicken broth in the fridge–real broth left over from cooking real chicken pieces the other day. Over the rest of the afternoon and evening I drank every drop of that broth, and in my deprived state it seemed positively sublime. On the plus side, I survived the day with minimal discomfort. I got some sewing done because I could sew during meals while everyone else was eating. Fortunately, I had plenty to do. I spent the morning helping Jasper power through four math lessons. We are trying hard to start getting him caught up, and math is relatively easy for him. I also did more housework and tackled another clutter nest that has been accumulating for who knows how long. And since for me sock season is over, I pulled most of the socks out of my drawer and packed them away. I’m keeping a few pairs accessible in hopes that I will actually start walking again soon. I can’t count on it because my arthritis has been acting up lately. While all this was going on I was trying not to think about the fact that I had hoped to be in Philadelphia this weekend, attending the second annual Realm Makers conference. I originally had to give up hope of attending because Spencer was supposed to graduate this weekend, but even though that is no longer happening, there was no way I could afford to fly to Philly and attend the conference this year. I sent the cloak to show my support, but that’s the best I could do. So I have felt a little sorry for myself this evening as I have seen updates about the early events showing up on Facebook. Oh well . . . maybe next year. I am brilliant. Well, I have some pretty good ideas anyway. Jasper has been begging me for computer time. (He had it taken away when he misused it.) I figured I would make him earn it. So today, he did get an hour of computer time, but not until he had done all of his assigned schoolwork. Motivation is such a wonderful thing, isn’t it? Meanwhile, I was cleaning off the hutch in the dining room. I am trying to tackle one cluttered area every day or so. I found all kinds of stuff. I found a box that had an Easter egg in it. The Easter egg contained a petrified peep in it. We didn’t even have an egg hunt the last two years, so this egg was at least three years old–possibly older, because we only do egg hunts inside when it’s raining. Who knows when the last rainy Easter was? Who knows why in the intervening years, no one looked inside that box? It was good to get that area cleaned up. I also got some sewing done and went on a brief trip to Walmart with Lucy. I watched some Mythbusters with Jasper and revised one of my stories yet again. It was an okay day. I had one goal for today. My one goal was to get three boxes in the mail. One was a birthday box for a young lady who has already had her birthday. One was a birthday box for a young lady whose birthday is today (that would be Lina!). And one was a birthday box for a young lady whose birthday is yet to come–in other words, the only one that has any hope of arriving on or near the big day. Each box needed to be packed carefully. Lina’s was the really challenging one because when you mail a box overseas you feel obligated to use every cubic millimeter of the box. I wanted to mail the box two months ago, but I was waiting on contributions from others and it took a really long time . . . So, after a grocery shopping trip to Walmart in the rain this morning, I tackled the job of carefully packing the boxes. Then of course there was the taping and addressing and filling out of the customs form. After lunch I went to the post office and got everything mailed. That was a good feeling. When I got home, I talked to Lina for quite a while and then I could finally focus in critique group stuff so I wouldn’t be embarrassed when I went to critique group tonight. As always, I got some helpful input from my critique partners. After that we had a good meeting with some great tips on marketing. That is really my weak skill. I would much rather write! 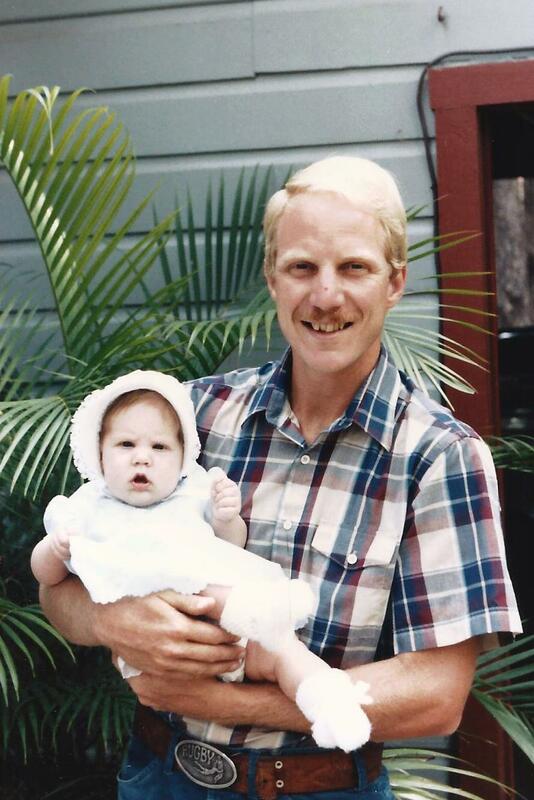 Lina with her daddy quite a few years ago! We celebrated Memorial Day yesterday, since Flynn was still with us and since I knew that Walter would be working all day today, on his day “off.” Flynn took Spencer to his church, Mercy stayed home to visit with her friend Kayla, and the rest of us went to our church. Kayla and her husband were still here when we returned, so we all had lunch together before they continued on to a relative’s house in the Dallas area. I had been slow-roasting a brisket all night, so all I had to do was chop it up in preparation for supper. I actually got a nice Sunday afternoon nap before getting up to make the homemade ice cream. It’s kind of a bummer making homemade ice cream and then not getting to eat any. Walter was actually working yesterday afternoon, but when he came home we had brisket and potato salad and corn on the cob and homemade ice cream. It was a very satisfying meal, but right afterwards we had to say goodbye to Flynn, and that was not satisfying at all. Today I stayed home instead of going to my Bible study. I really felt like I couldn’t afford to lose my whole morning. I did some sewing, some preparation for mailing various things to various people, and some writing and editing. Meanwhile, my poor hard-working husband was working a floor job involving limestone tiles, finish stripper, razor blades, a sander, and a new coat of finish. He worked about 14 hours, I think. He is one tired guy and he has jury duty tomorrow. Since Walter wasn’t here for supper (and neither were Mercy or Spencer), we decided to eat in the living room while watching a movie. The movie we watched was the second Hobbit movie, which Jasper and I had not seen until tonight. There is much I could say about it, but I will restrain myself and simply say that I am very, very glad I didn’t stay up to go to the midnight showing when it first came out. After the movie I finished my sewing project (yay me!) so I will be able to put it in the mail tomorrow along with quite a few other things. I’m not sure why I suddenly have a batch of stuff to mail. 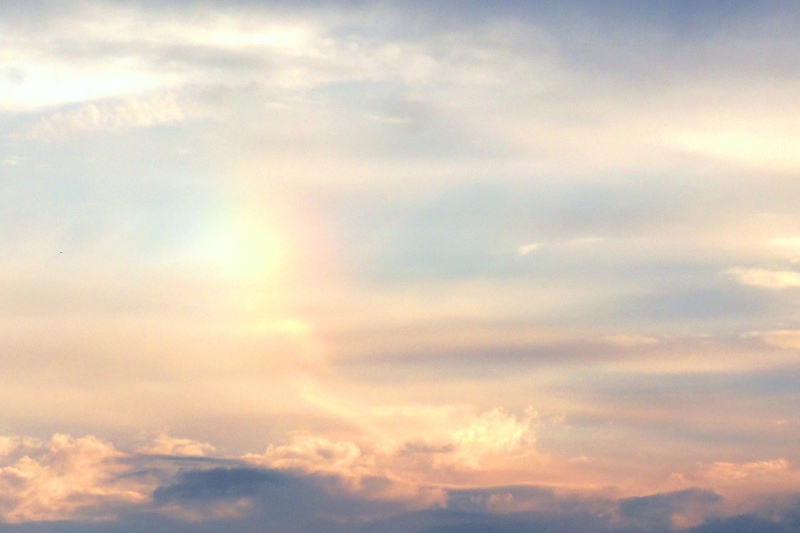 When every ray of light had fled, O glorious day! Raising my soul from out the dead, love found a way. For such a sinful wretch as I, how can it be? I am redeemed, set free, forgiv’n, love found a way. Where in eternal power and might Jesus shall reign. There was no help in earth below; love found a way. After yesterday’s embarrassment, I found myself wishing that I had been more timely in cleaning up the house in anticipation of house guests. Mercy’s friend Kayla and her husband are due to arrive to spend the night with us tonight, so today was a cleaning marathon, with Mercy bearing the brunt of all the hard work and me mostly sorting through mountains of paper. This is after I went to Walmart, of course, and felt so ill when I got home that I had to go back to bed for a little while. I am currently taking some medication that has some unpleasant side effects, but I don’t mind because it really seems to be working. We got a lot of cleaning and sorting and tossing done. Mercy’s friends got a very late start and then took a very puzzling route, so as I write this (11:00 p.m.) they have still not arrived. We are hoping to see them by midnight. Meanwhile, we got to eat the nice dinner we had planned to share with them and I have already baked tomorrow morning’s coffee cake. And I found out that the cloak I made is not going to be a door prize after all. They’re going to raffle it off to raise scholarship money. How cool is that? Today I had to take Spencer to work for the last time at Hastings. He is glad to be done with that job. On the way home, I stopped to get some food for our foray to the lake, then was taken aback when the kids’ piano teacher showed up because I had forgotten we moved their lesson to this morning! That was the first surprise. The second, and much bigger surprise, came this afternoon when I looked out the window and saw an unfamiliar van in our driveway. This was soon followed by a knock on the door. When I opened the door I found Bev standing there. Bev was my last college roommate before I got married to my current roommate! I had not seen Bev for roughly 33 years. I had heard she was in town (thanks to Facebook) but had no way to contact her. She and her husband are here to have one of their sons check out the university, and Bev had seen Walter there, so she found out where I lived and today she came to visit. It wasn’t a long visit, but it was fun to catch up. We both have seven children–something I’m pretty sure neither of us foresaw back in our college days! Of course, I would have enjoyed her visit more if I had, you know, looked like a sentient being and had my house looked like a place where sentient beings actually live. But, that’s not going to stop me from visiting with an old friend who makes the effort to come see me! After Bev left, Lucy and Jasper and I got ready to go out to the lake and this time I had an actual checklist so we didn’t forget anything vital. 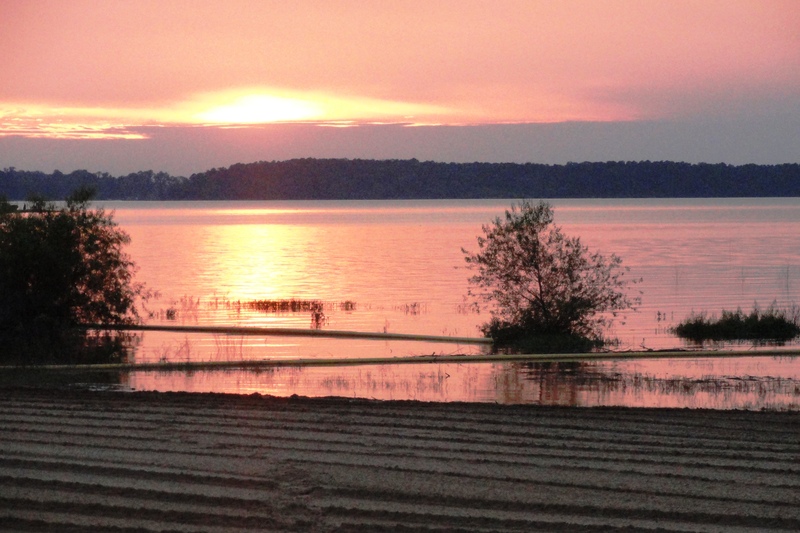 The beach area was covered with dandelions and the beach itself had been plowed or something which made walking in the soft sand very difficult. 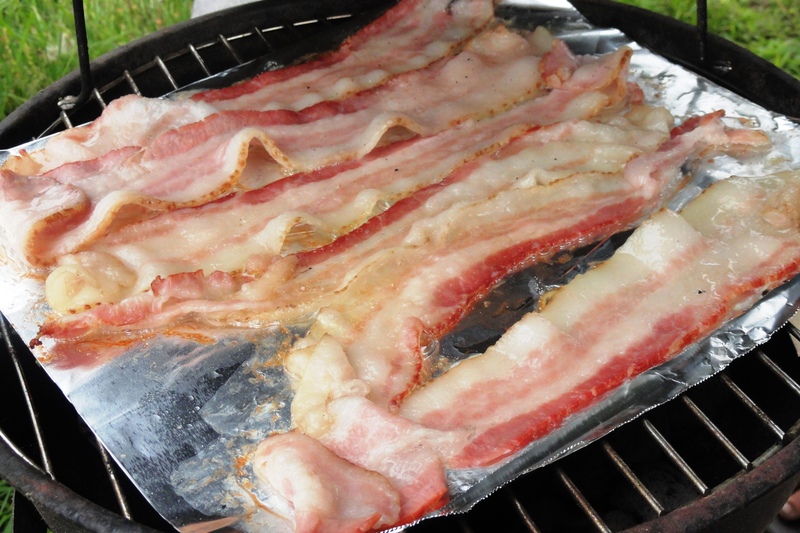 I also toasted the bread over the coals and then we assembled our BLTs. The result was a very delicious sandwich with the bread and bacon still hot and the lettuce and tomatoes cold. YUM! I’m pretty sure we’re going to do that again. And of course we had marshmallows to roast for dessert. After that I had no excuse to refrain from going swimming with Jasper, so we trudged through the deep, soft sand to get to the water, which was very cool and refreshing. The whole time we were out there no one came to the beach. There were plenty of people out in boats and in other areas in the park, but we had the beach area completely to ourselves. Unfortunately it doesn’t show up as well on the photo as it did in real life! It was a lovely day but the drive home through the twilight seemed to take forever! We lay out in the front yard hoping to see the meteor shower, but all we saw was lots of clouds. Oh well . . . It sure felt good to finish that cloak last night! Well, the construction was finished, anyway. This morning after I took Spencer to work and dropped off his friend Josh, I came back here and took care of a couple of loose threads and then did the label. I had this idea that I would embroider my name and Realm Makers and the date on the inside of the neck band. I thought that would make it more memorable for whomever gets it. However, it turns out that velour is not a very good surface for embroidery. It looks like something a highly distracted and demented toddler might produce. By the time I realized how bad it was, I didn’t have time to pick it out so I just finished it. Oh well . . . 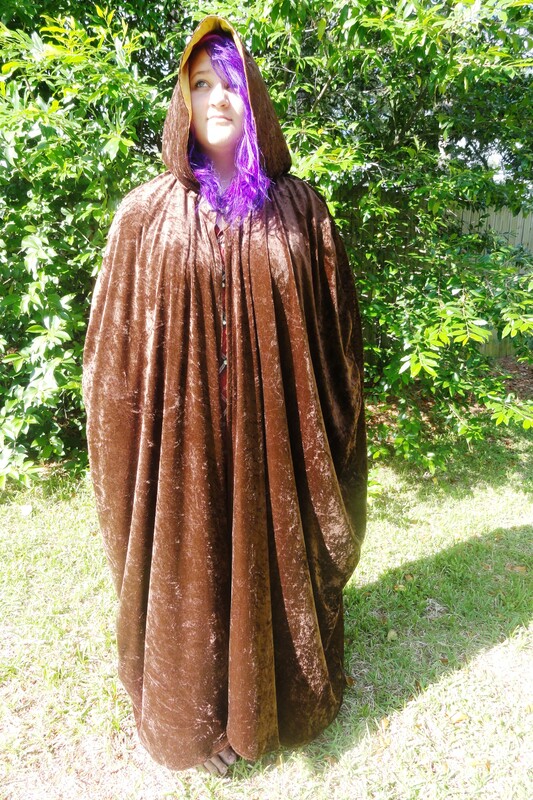 I call it the Radagast cloak because it is brown (duh!). I thought I had some brown satin to line the hood with, but it turns out I had already used it, so I had to get yellow satin. I still think it’s very pretty. However, it is not as pretty as a similar cloak that I have seen. There was a guy who used to come to the faire dressed as Radagast, and he had an absolutely stunning brown cloak made of real velvet. I couldn’t afford velvet, even if I could find it, not to mention the fact that sewing with velvet pretty much makes me suicidal. 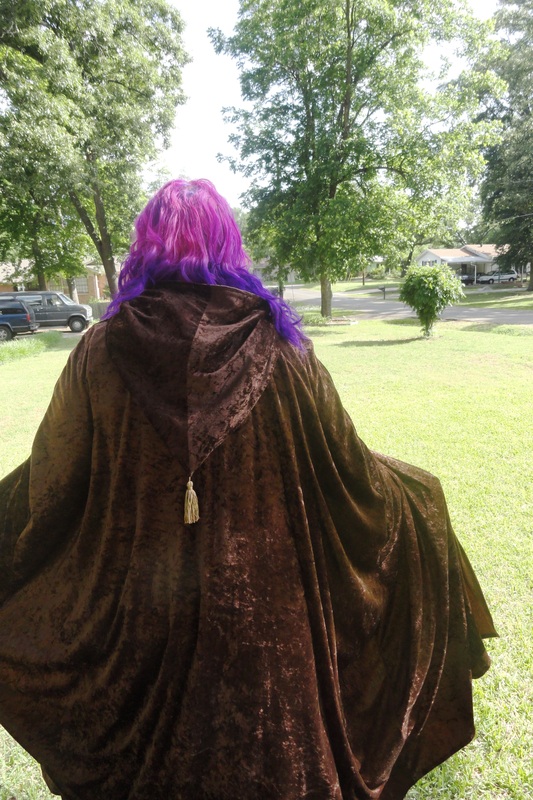 So, I am relatively happy with this velour cloak, which is already on its way to Pennsylvania. I actually started my next sewing project this afternoon. I feel so noble. Today was another struggle with sun poisoning (it can last up to 3 days) but I am beginning to feel a little better now. I had to pick Spencer up from work this afternoon and when I got there, he didn’t want to be picked up! Kat was there and he wanted to hang out there until she went to work. I didn’t want to go all the way home and then come back, so I walked down to Barron’s and did some window shopping and got a drink. I had not been into Barron’s for many months. It’s just not the same since they got rid of almost all their books. So, lots of things had changed. Almost nothing in the store is suitable for someone on a budget, but it’s still fun to look! And if I see a bag I like, I can study it to see if I can make something similar. Have I raved about these silicone lids before? Well, I’m going to rave about them again. I got my first silicone lids last summer when I was visiting my parents and I found them in a gift shop in their town. Since then they have become indispensable. I have bottle stoppers, mug covers, and three sizes of bowl covers. I have a huge one that covers a 9×13 pan, but until today I didn’t have a square one that would cover an 8 or 9 inch square pan. As long as the bowl or pan has a smooth rim, these lids form an airtight seal. They can go into the oven or microwave. In the fridge, they eliminate the need for cling wrap to cover an open bowl. They are very easy to wash as food does not stick to them. I love them. They come in several different colors and designs. I use them all the time. They are not cheap, I admit–but on the other hand, they never wear out and they save me having to use cling wrap or foil most of the time. 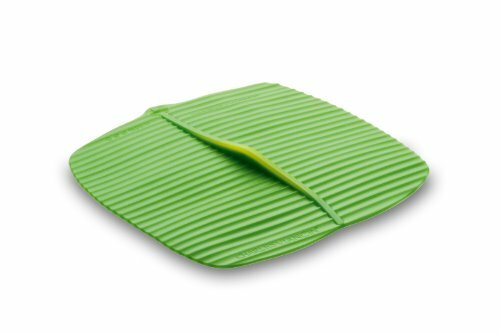 And if you have a glass dish with a broken lid, you can use one of these instead. Okay–commercial over! Tomorrow is going to be pretty busy, I think. Well, today could have been worse. I could have been running a fever and shivering and puking. Instead I just had the headache and nausea and stomach cramps that were my gift from Mr. Sol. The sunburn hardly seems worth mentioning! Can you believe I used to love hanging out in the sun? Now, I have to hide from it. So anyway, it was a little hard to work on my sewing project today, because I didn’t feel well and I had to keep lying down. As the day went on, I realized something else. I have had a terrible time finding the motivation to finish this project. It’s so hard to make myself work on it! What I realized is that most of the time, I sew for love. A year ago, I was feverishly working on a wedding dress and going without sleep to get it done. I was highly motivated by my love for my daughter and my desire to create for her the dress she wanted. This project, on the other hand, is something I volunteered to make to show my support of an event that I would dearly love to attend. The problem is that I have no idea who will end up receiving this cloak. I am making it in a vacuum, so to speak. There is no love motivating me to work on it–just the horror of possibly failing to keep my word. So, it has been a struggle but it is finally done. I will take photos tomorrow once it is light.